Two months before Neil Armstrong set foot on the Moon, Apollo 10 completed the final test mission, doing everything except land on the Moon. 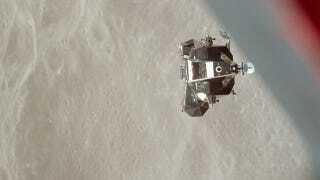 Now amateur astronomers are looking for Apollo 10's long-lost lunar module... which is, rather adorably, named "Snoopy." Apollo 10 was the last of four dry runs conducted by NASA before the actual attempt was made to land on the Moon. Apollo 7 got Americans back into space after the tragic deaths of the Apollo 1 astronauts, Apollo 8 became the first crewed spacecraft to break Earth orbit and reach the Moon, and Apollo 9 tested the lunar module in low Earth orbit. But it was Apollo 10 that put these all together, reaching the Moon and performing practice maneuvers to make sure a landing would be feasible. But it's what the crew did as they left the Moon that is now attracting the attention of astronomers. The astronauts jettisoned the lunar module - given the call sign "Snoopy", to go along with the command module's "Charlie Brown" - as they left the Moon's orbit, and the module actually managed to escape the Moon's gravitational pull and enter into an orbit around the Sun. That means it's still out there somewhere, making it the only lunar module used during the Apollo program to survive intact. "The whole history of Apollo is remarkable and includes some of the most inspiring scientific and explorative missions in history. We thought this would be an exciting way to engage schools. Whilst there is every chance we won't find it, it's like the lottery – unless you play, you don't win it. With our Snoopy project, we hope to involve hundreds of pupils. We expect to discover dozens of new asteroids and maybe some comets too in our search areas so we'll be doing great science at the same time." "The key problem which we are taking on is a lack of solid orbital data since 1969. We've enlisted the help of the Space Exploration Engineering Corp who have calculated orbits for Apollo 13 and working closely with people who were on the Apollo mission team in the era will help us identify search coordinates." Finally, just in case you're wondering where all the rest of the lunar modules got to, here's the breakdown. Apollo 11 and 16 left their modules in orbit, and they eventually crashed into the Moon. Apollo 12, 14, 15, and 17 all intentionally crashed their modules into the Moon to test out seismometers they had place on the lunar surface. Apollo 9 and the uncrewed Apollo 5 never left Earth orbit, so their modules simply burned up in Earth's orbit. The same fate befell Apollo 13's lunar module, but not before it was used as a lifeboat to get the crew back to Earth after an oxygen tank exploded and the service module was damaged. Via Skymania and Discovery News. Image via NASA.